Transforming the economy, replacing government dysfunction with results, putting people above party, and restoring New York as national progressive leader. Albany, NY - January 8, 2014 - Governor Andrew M. Cuomo today delivered his 2014 State of the State Address, outlining a sweeping agenda which builds on the success of the last three years to change the direction of New York State: reducing spending below inflation and personal income growth for the first time in 40 years, transforming a $10 billion deficit into a $2 billion surplus, reducing unemployment in all ten regions of the state, creating nearly 400,000 new private sector jobs (the highest job creation in the state’s history), improving the state’s credit standing with all three rating agencies, increasing exports by 15% and delivering on longstanding progressive policies that have made our state safer, healthier, and fairer for all New Yorkers. The Governor’s agenda for 2014 continues this progress: controlling spending while cutting taxes to create jobs and make the state more affordable for families, expanding successful economic policies and rebuilding infrastructure, making bold new investments to transform classrooms and improve the quality of education for all students, and continuing to fight for equal rights and opportunity for all New Yorkers. 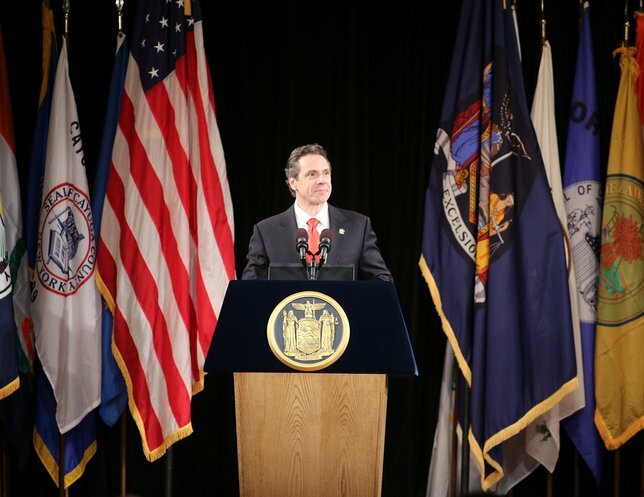 Governor Cuomo outlined the following initiatives as part of his State of the State message. For more information, click here. Tax Relief: As a result of fiscal reforms from the last three years, the State is poised to go from a $10 billion deficit when the Governor took office to a $2 billion surplus by 2016-17. Rather than using this revenue to increase spending, Governor Cuomo proposed to instead cut taxes for New Yorkers and businesses to provide taxpayers relief and grow the economy. The proposals have been informed by the hard work of the New York State Tax Reform and Fairness Commission and the New York State Tax Relief Commission. Click here to learn more. Freeze Property Taxes for Working Families: New York’s real property taxes are among the highest in the nation, and one of the main reasons is the large number of local governments that place high burdens on taxpayers and harm the business climate. To address this issue and incentivize local governments to share services, the Governor proposed to freeze property taxes for two years, providing nearly $1 billion in tax relief. Residents will be eligible for the freeze in the first year if their local governments stay within the property tax cap. During the second year, local governments must also take concrete steps to share services and reduce costs in order to remain under the freeze. Create a Property Tax “Circuit Breaker” Based on Ability to Pay: 1.9 million low- and middle-income taxpayers pay an effective real property tax rate relative to income that exceeds their income tax rate. To help these families and individuals, the Governor proposed providing tax relief based on ability to pay for households that earn up to $200,000, ultimately providing $1 billion in tax relief by the time the circuit breaker is fully phased in. Provide Tax Relief for Renters Facing Significant Housing Burdens: In New York State, 3.3 million households rent their homes, and more than 829,000 low-income renters pay more than 50% of their monthly cash income on housing costs. To provide meaningful tax relief to millions of New York’s renters, Governor Cuomo proposed a refundable personal income tax credit that takes into account a family’s size. The credit will be available to renters with incomes below $100,000 and will provide over $400 million in tax relief for 2.6 million renters. Additional Tax Relief to Boost Manufacturing: To propel and spur new economic growth, particularly in Upstate, Governor Cuomo proposed creating a refundable credit that would be equal to 20 percent of a firm’s annual real property taxes. Additionally, to grow existing manufacturers and attract new businesses Upstate, Governor Cuomo has proposed eliminating the corporate income tax rate for Upstate manufacturers. Together, these two proposals would provide approximately $161 million in tax relief to the manufacturing sector. Corporate Tax Reform: Streamlining the State’s corporate tax structure is another way to improve New York’s business climate and promote economic growth across the state. To do this, Governor Cuomo proposed merging the bank tax into the corporate franchise tax and lowering the rate to 6.5 percent. This would be the lowest corporate tax rate since 1968 and provide $346 million in annual tax relief to New York’s businesses. Estate Tax Reform: New York is one of only 15 states in the country that imposes an estate tax, and New York currently taxes significantly more of an individual’s estate than the federal government, creating a perverse incentive for elderly New Yorkers to leave the state. To address this burdensome tax, Governor Cuomo proposed increasing New York’s exemption threshold to match the federal government, and lowering the top rate to 10 percent over four years. Accelerate the Phase-Out of the 18-A Utility Surcharge: New Yorkers pay some of the highest energy rates in the nation, and the Temporary Utility Assessment (18-A) adds to this burden for families and businesses, particularly energy intensive industries. It is scheduled to phase out by 2018, but Governor Cuomo proposes accelerating the phase-out by $200 million per year, immediately eliminating the temporary surcharge for industrial customers, and hastening the phase out for residents and other businesses. Joint Executive-Legislative Commission to Reduce Regulatory Barriers on Business: After years of discussion in the state government with no action, the Governor proposed finally creating a joint commission with the state Legislature to identify ways to eliminate regulatory barriers that make it difficult to do business in New York State and hinder economic growth. Expedite Transmission Projects that Rely on Existing Transmission Corridors and State-Owned Rights-of-Way: The State’s transmission infrastructure is antiquated and is preventing excess power in Upstate New York from entering the downstate region where demand is greatest. Transmission bottlenecks on the aging electric grid increase utility bills and result in adverse environmental and economic consequences when older, less efficient plants must run more frequently. In order to meet the State’s electric needs as well as preserve the quality of life in local communities, the Governor proposes expediting projects that would be built wholly within existing transmission corridors or buried along existing State-owned rights of way such as waterways and highways. Launch REDC Round 4 to Create Jobs and Attract International Investment: The Governor will launch “Global NY” which will link START-UP NY and the Regional Economic Development Council initiatives to attract international investment and jobs to Upstate New York. In this fourth round of the REDCs, the State will recognize and reward plans that incorporate Global Marketing and Export Strategies. The Governor will also create the START-UP NY Global Initiative to attract foreign direct investment and grow exports by leveraging the START-UP NY program. Host Global NY International Business Conference: In 2014, the Governor will host the Global NY Summit on World Trade and Investment to reach foreign investors and create a peer learning network among local and regional leaders. Continue to Attract Visitors Upstate and Outdoors: Governor Cuomo will continue to boost the Upstate economy by encouraging New Yorkers and visitors to explore and enjoy the area’s unique treasures. The Governor will create the NYS Adventure License – a driver’s license that includes optional icons for all of an individual’s lifetime license designations, such as the Boater Safety Certificate and the newly created lifetime State Parks’ Empire Pass. The Governor also proposed a bold new outdoors initiative to create 50 new access projects to connect hunters, anglers, bird watchers and other outdoor enthusiasts to untapped State-owned lands. The Governor will also make the revitalization of New York’s park system a continuing priority to attract new visitors. The Governor today unveiled the first ever I Love NY tourism smartphone app. Developed in partnership with AT&T, the app provides comprehensive geographically targeted tourism, recreation, lodging, and dining options in every region of the state. The app is available right now on the Apple app store and Google Play. Encourage Targeted Investment through Key Industry Summits: Governor Cuomo will host a second round of industry summits to identify additional economic growth opportunities, including a new Upstate-Downstate Food-to-Table Agriculture Summit in 2014 to connect the Upstate agriculture industry to downstate consumers and markets. Bring World-Class Destination Resorts to Upstate NY: In 2014, the State will begin taking steps to bring world-class destination resorts to Upstate, including appointing a Gaming Facility Location Board to select bidders through a merit-based and transparent process. The process will be designed to produce the best and highest quality bids and bidders in order to increase tourism and encourage Upstate economic growth. Create the NY Genomic Medicine Network: The Governor proposed establishing the NY Genomic Medicine Network – a partnership that will link the medical community in New York City with the University at Buffalo's computational infrastructure and biomedical research expertise at the Buffalo Niagara Medical Campus – to develop Upstate New York as a national center for genomic medicine research and jobs. Modernize Our Airports: the Gateways to New York: New York’s airport system is one of the busiest in the world. JFK and LaGuardia airports are major economic engines for the New York City region, but they are consistently rated among the worst airports in the country in terms of design and overall passenger experience. Governor Cuomo proposed steps to upgrade these two major gateways to the state, including assuming management responsibility for airport construction from the Port Authority to ensure these critical transportation hubs are modernized efficiently and quickly. Launch a Medical Marijuana Program to Research the Feasibility of Medical Marijuana in NYS: Research shows that medical marijuana may help manage the pain and treatment of cancer and other severe illnesses. To provide relief to patients suffering from serious illnesses, Governor Cuomo will use existing statutory authority (The Antonio G. Olivieri Controlled Substances Therapeutic Research Program; PHL Art. 33-A) to launch a pilot medical marijuana research program that allows up to 20 hospitals to provide medical marijuana to patients being treated for serious illnesses. This program will allow qualified eligible participants to seek relief for their symptoms in a safe and legal manner, while also evaluating the effectiveness and feasibility of a medical marijuana system. Its findings will be used to inform future policy. Create the Commission on Youth, Public Safety & Justice to Help NYS “Raise the Age”: Governor Cuomo proposed establishing a Commission on Youth, Public Safety & Justice to provide concrete, actionable recommendations regarding youth in New York’s criminal and juvenile justice systems. New York remains one of only two states in the nation whose age of criminal responsibility – the age at which youths are treated as adults – is just 16. As a result, in 2012, nearly 40,000 16- and 17-year-olds in New York had their cases handled in adult or criminal court, where they are less likely to receive the services they need. The ultimate goal of the Commission will be to create a roadmap to help these young people become productive, successful adults. Expand the Successful NY Youth Works Program: Since its launch, the NY Youth Works program has helped more than 13,000 of New York’s inner city young people find employment at 1,270 businesses. Governor Cuomo proposed increasing the size of the program in 2014 from $6 to $10 million for each of the next four years, incentivizing employee retention with additional tax benefits, and providing training funds to employers through the existing Job Linkage Program. Create and Preserve 3,000 Units of Affordable Housing: Last year, the Governor launched House NY to build and restore more than 14,000 affordable housing units statewide. This year, the Governor proposed a $100 million additional investment to build and preserve 3,000 additional affordable housing units in multi-family developments. This construction would also lead to the creation of more than 3,500 new construction jobs. Launch the New York State Council on Community Re-Entry and Reintegration: To enhance the State’s efforts to help formerly incarcerated individuals successfully re-enter and remain in the community, and ensure that State policies regarding a broad spectrum of issues – housing, health care, education, employment, and veterans’ services, among others – are aligned with both federal and local efforts, the Governor proposed creating the New York State Council on Community Re-Entry and Reintegration. This Council will bring leadership from a wide array of agencies together with key community stakeholders, including non-profits and re-entry service-providers statewide. Ethics Reform: The Governor has made restoring New Yorkers’ trust in state government a top priority. This year, he will continue to fight for reforms to ensure New Yorkers have confidence that their elected officials are serving them faithfully. He proposed new anti-bribery and corruption laws, public financing of elections, independent enforcement and oversight at the Board of Elections, and disclosure of outside clients with business before the State. Protect Students Against Discrimination and Harassment: In November, New Yorkers were horrified to learn about terrible allegations in the news of anti-Semitism in the Pine Bush Central School District. In response, Governor Cuomo immediately ordered an investigation by the State Police and the State Division of Human Rights. This year, the Governor is taking steps to ensure that all students are protected from any discrimination and harassment. He proposed amending State law to require all public schools to notify the State Education Department (SED), the Division of Human Rights and the State Police if there is a pattern of discrimination or harassment. Schools will also be required to implement SED-constructed plans to remedy these injustices. The Governor also proposed to amend the Human Rights Law to ensure that all students are afforded protection against discrimination. Stop Repeat Drunk Drivers: Three Strikes and You’re Out: Governor Cuomo will continue to lead the fight against drunk and dangerous driving in 2014. He proposed a new law that will suspend licenses for five years for drivers found guilty of two convictions for driving while intoxicated or driving while impaired by drugs or alcohol in a 3-year period. The law will also provide for full revocation of licenses for those drivers who have three such convictions in their lifetime. Continue to Crack Down on Youth Texting and Driving: For any person under age 21 convicted of texting-while-driving, Governor Cuomo proposed a new law that will double the period of their license suspension from six months to a year. Continue to Expand Opportunities for MWBE Businesses: In the last three years, New York State has made great strides in increasing equal opportunity in contracting for Minority- and Women-owned Business Enterprises (MWBE). MWBE participation met and exceeded 20 percent for the first time in the program’s history. To continue this success and increase MWBE economic growth, Governor Cuomo proposed increasing the number of MWBE certified firms by an additional 2,000. Promote and Grow Businesses Owned by Disabled Veterans: To support and expand economic opportunity for New York veterans and military families, Governor Cuomo proposed steps to establish a 5% goal in the awarding of state contracts to service-disabled veteran-owned small businesses. The Governor will also convene a Veterans and Military Families Summit this year to address the unique issues faced by these New Yorkers and determine how the State can better serve them. Meeting the education needs of New York’s students gives them a path to prosperity and the tools to become productive members of society, while also providing a more secure economic future for the state. The Governor proposed a series of actions that build on the progress and investments from the last three years to ensure all of New York’s students receive a quality education. Launch the Smart Schools Bond Referendum: The Governor proposed a $2 billion “Smart Schools” bond referendum to help bring all of New York schools to today’s high-speed, high-tech world. If approved by voters, the initiative will provide students with state-of-the-art classrooms and leverage technology to transform education. “Smart Schools” funds will be allocated to each school district. Encourage the Best and Brightest STEM Students to Stay in New York: The Science, Technology, Engineering and Math – “STEM” – fields are one of the fastest-growing sectors of New York’s economy. To encourage the best and brightest students to pursue STEM college degrees and build their careers in New York, Governor Cuomo proposed providing full tuition scholarships to any SUNY or CUNY college or university to the top 10 percent of high school graduates if they pursue a STEM career and then work in New York for five years. Reward the Most Effective Teachers: Building on the universal implementation of the teacher evaluation system, the Governor proposed creating a Teacher Excellence Fund to help school districts reward the most effective teachers. Highly effective teachers in participating school districts will be eligible for up to $20,000 in annual supplemental compensation through the Teacher Excellence Fund. Expand and Launch Another Round of NYSUNY 2020 and NYCUNY 2020: The Governor proposed another round of NYSUNY 2020 and NYCUNY 2020 that have made the State’s public universities incubators of academic excellence and economic growth. This year’s program will expand New York’s strategic investment in higher education performance by awarding plans that use technology to improve academic success and economic development, leverage opportunities for public-private partnerships through START-UP NY, and provide experiential learning opportunities such as internships to better connect students to the workforce. Make Full-Day Pre-K Universal in New York State: Expanding on last year’s program to provide full-day pre-kindergarten to children in the highest-need communities, Governor Cuomo believes that it is time to fulfill the State’s goal of truly “Universal Pre-Kindergarten” access for all children. Following the impact of Superstorm Sandy, Hurricane Irene and Tropical Storm Lee, Governor Cuomo proposed a $17 billion strategy that will transform New York’s infrastructure, transportation networks, energy supply, coastal protection, weather warning system and emergency management to better protect New Yorkers from future extreme weather. The Governor also proposed the Penn Station Access Project to provide critical system resilience to protect Metro-North service in the event of natural or other disasters. The entire Metro-North system currently depends on the Harlem River Lift Bridge and the Mott Haven Junction remaining fully operational to provide access into and out of Manhattan. The need for additional railroad network resiliency was made clear by Superstorm Sandy, when for the first time in their 100-year history, the Hudson River tunnels and two of the East River tunnels into Penn Station were flooded. Using existing tracks, the project would establish new links for the New Haven Line that will bypass both of these corridors. It would also provide Metro-North with access to a second Manhattan terminal in the event an emergency affects Grand Central. The Governor proposed constructing four new stations under the Penn Station Access Project in the Eastern Bronx and the purchase of new rail cars to support the new service. The project will for the first time connect these communities via commuter rail both to Manhattan’s West Side and to the I-95 corridor, while improving resiliency against natural and man-made disasters. The recommendations of the federal Hurricane Sandy Rebuilding Task Force, chaired by U.S. Housing and Urban Development Secretary Shaun Donovan, helped provide a blueprint for the State in its long-term rebuilding process. For more information, go to http://www.governor.ny.gov/press/01072013-cuomo-biden-future-recovery-efforts. Launch a Study on Improvements to Enhance North Country Access: Residents and businesses in the North Country region have long expressed interest in better connecting I-81 in Watertown to I-87 in Champlain along a route running south of the Canadian border and just north of the perimeter of the Adirondack Park. Numerous projects have been proposed since the 1950s. New York State will now conduct an in depth feasibility study to develop the most efficient transportation enhancements for this important North Country corridor. Subject: LongIsland.com - Your Name sent you Article details of "Governor Cuomo Outlines Agenda for 2014"